Avengers Arena #18: As Marvel Now hit six months, seven issues of this title were released and I gave the title a B- on my Marvel Now Report Card. I’ve read a few more issues after that and then held off reading any more knowing that it would eventually end. So a complete reading is in order now that this final issue has hit. Once it’s all wrapped, I can see this title getting a high B+. It was a slowish start, but it managed to entertain and keep my interest (can’t say that about writer Hopeless’ other title, Cable and X-Force). Looking forward to this corner of the Marvel U. continuing in Avengers Undercover. The Best of Comix Book: When Marvel Went Underground HC: A collection of stories from 1974-1976. I have no knowledge of this series. For historical and reference purposes, this is a win. 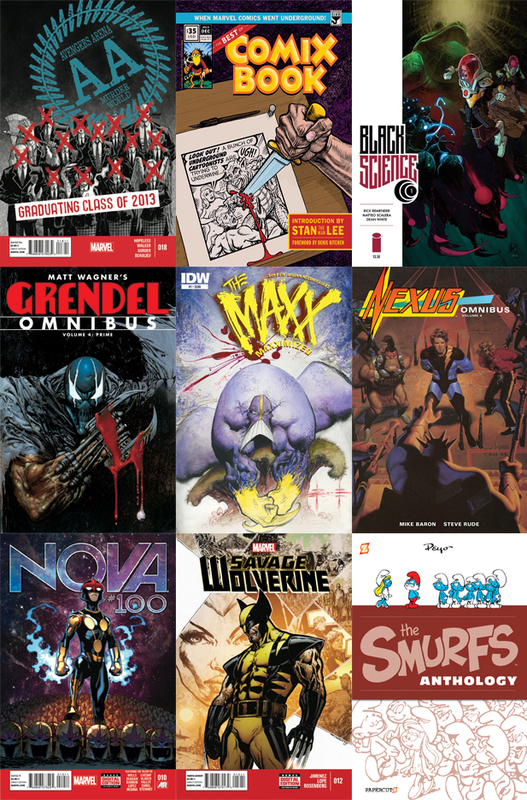 Nova #10/100: An anniversary issue. That’s enough for me. This book has floundered a bit trying to gain traction with all of the writer switches. Not sure what to think of incoming writer Gerry Duggan taking over the book. Deadpool is dreadful but this is (hopefully) a far different book. So maybe there’s a chance. If it’s just another lame joke filled comic, I’m out. Savage Wolverine #12: Phil Jimenez, one of my favorite artists, is taking over the title as artist and writer for two issues. After that, I’m dropping this title. Perhaps if another noteworthy creator picks it up for a small run I might pay a return visit. But Wolverine has never been a character that I want to read in these kind of stand alone side stories. See that middle row up there? Grendel, the Maxx, Nexus. All titles I’ve never read. To be fair, I think I read a Batman/Grendel crossover. And I know I owned at least one issue of the Maxx from way back. But yea – I need to correct this. Black Science #1: This new series by Rick Remender is getting major love on various sites. Outside of a few Indestructible Hulk issues, I’m unfamiliar with artist Matteo Scalera but Dean White is a beast of a color artist. When I gave it a nod on a Previews post, I wasn’t completely sold so now that it’s out, I’ll get to see for myself if all the love is warranted. Smurfs Anthology HC vol.2: Because childhood. And that’s always worth it. Curious to hear what you think if Black Science. I enjoyed the vintage quality of the art, colors were fantastic. Good start for the series, since it has me wanting to read the next issue. Still haven’t read it – I’m probably going to let a few issues pile up and then read it as a whole. I’ll be sure to talk about it when I do! Pete did you ever read any of the Grendel series by Comico back in the 80s? Loved Comicos output at the time and it was the first “Mature” book I ever bought off the newstands! Thoughts anyone?